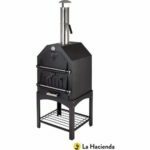 This multi-functional 3 in 1 barbecue, pizza oven and smoker includes a cordierite pizza stone to help prepare the perfect crispy base whenever you fancy a treat for dinner. With a stainless steel grill for barbecuing a range of foods such as steaks, fish and vegetables, and a damper for smoking food to help give it the perfect rustic flavour, this outdoor oven will soon be your go-to cooking friend and all your indoor appliances will become second best. If you’re feeling brave, it even handles roasting beef joints, chicken, pasta dishes and baking bread, so there is no need to keep running inside to check on the food if you want to sit outside and make the most of the pleasant weather. Extra features include a cooling rack which is easy to access and gives things a chance to cool before you serve them, as well as a handy temperature gauge and removable ash box which takes a lot of the effort out of cleaning. The maximum temperature it can reach is 550°C, so it easily handles the optimum 350° needed for the perfect pizza preparation. There are no wheels, and it is quite heavy due to the build and materials, so if you want a model which is transportable this may not be the one. However, this makes it perfect for those who love their pizzas and will be using it regularly; the build quality and extra features makes up for the lack of manoeuverability. 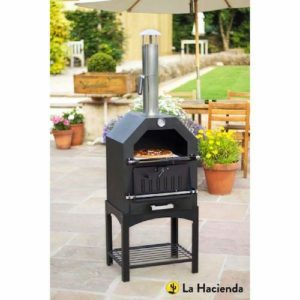 This La Hacienda oven is the perfect addition to any garden and outdoor space, and the durable steel construction means it will last for years to come without becoming damaged, even if the weather takes a turn for the worse.